Despite this report being almost a month after the fact, there is still precious little time to talk about our second event of the year. The format was standard at least; a double-header format with two, 6-lap races at Willow Springs Raceway. The most exciting thing was the unknown of Lucky 13 racing, back from a three year hiatus. Mark Macunga and Bobette Burdick were a seriously fast pair on an F2-style chassis somewhat similar to our own, just a few generations newer. In practice our times were actually almost 2 seconds off our record pace, which surprised me considering their were favorable conditions. Lucky 13 had no transponder on their bike so the only time we saw them in practice we pulled away a bit, but that means little when racing actually begins. This time we decided to start from the front row instead of the back of the field. This was due to the sixteen sidecars that made up the grid and the fact that it didn’t make a huge difference during round 1. Starting in the back is pretty common with faster teams, who voluntarily do it to make the race more interesting. I found that it made me lazy in trying to get a good start and that we could clear the field in the first lap. I did not like the, “meh, I’ll wait until next lap” mentality it gave me; when you do sprint races I believe you should be fast from start to finish. With expectations of racing in the Isle of Man TT race (over an hour of racing), I wanted to concentrate on racing without concern for the other teams and such. Starting from the front allowed us to get a scorching start and I was honestly surprised to see 3-4 other bikes in tow. Although we eventually snuck away and finished well ahead, it took a full lap before and gap appeared, and even during the second lap I think the competition was pretty close. It’s hard to say from onboard; the mirror on the bike is not really designed to see approaching bike, but instead is positioned to see where the passenger is on our own bike. The race ran without much incident. We had no scary moments but our times were barely into the 1:37 mark (we can normally run 1:37‘s consistently), so I chalked that up to being too relaxed. I did experience arm pump by the third lap and I should also be honest and admit the bike’s handling was pretty abusive. 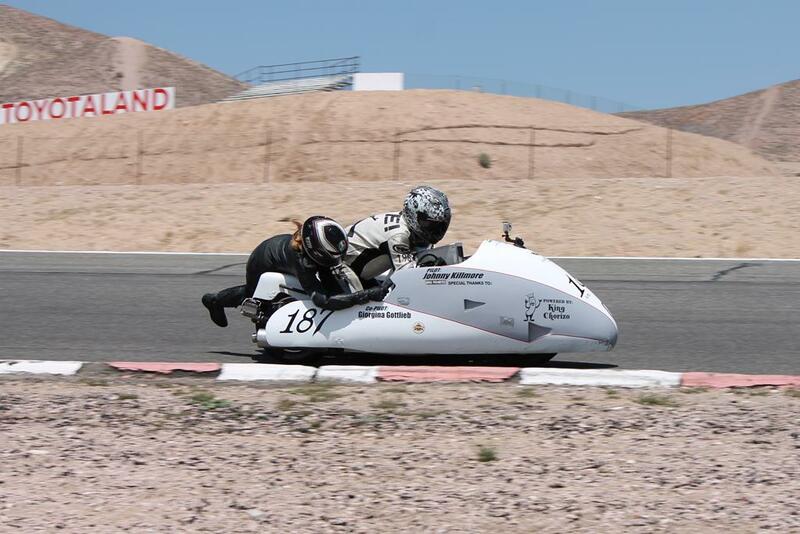 The handlebars were everywhere in the fast corners of Willow Springs, with famous Turn 8 being specifically sketchy. It was so bumpy my vision was being blurred and I was really having to swallow a lump in my throat to keep the throttle open as we approached Turn 9 each time. The bike was also sliding a lot, everywhere. The chair tire would let go and the rear would spin up. In tight Turn 4 the whole bike would let go and slide wide onto the bumpy pavement of the outside. It was a jarring ride to say the least. Still, we won by a solid margin and had some ideas about tomorrow’s race; specifically a new rear tire to help with wheelspin and some changes to tire pressure to (hopefully) stop the tires from getting so greasy at the end. Sunday had a surprise in the form of Becker Moto Works. The defending champs were running their brand new vintage racer. Yes, you read that right. Brand new vintage. As in, from the ground up built in-house with a Yamaha XS650 engine for power. Although the machine looked and ran well, the engine vibrations were so bad that William Becker’s hands and feet were going numb halfway into the race. In need of some rubber engine mounts, he elected to run his multi-time champion Formula 1 machine. After a new rear tire and some practice we have not significantly dropped our lap times, so things were not looking up for us. From the start we were on a flyer. Usually it takes Becker a few laps to get up to speed and find a rhythm, so I figured we would just go as hard as possible from the start and just keep it that way for all 6 laps. Again for the first lap there was a flurry of color behind us. There were 2-3 different bikes fighting each other for the second spot. None of them were red though, so neither Becker nor Lucky 13 were in sight yet. Lap 2 and 3 were really smooth. We seemed ahead by a significant margin, but I really don’t know. The only time I could really look was from the front straight, looking back to Turn 7. Any bike there would be at least 20 seconds behind you though, so I just kept pushing. Gina was hitting all her marks like a pro and the first three laps were the same for me… then my arms started to go numb again. I was still being beat to death in the fast right turns (2, 8, and 9). The turns are so long they require you to hold the handlebars against tremendous forces… the bumps shaking your entire upper body. Combine that with holding the weight of myself and Gina in right hand turns and it just becomes exhausting. I knew our lap times were dropping, but where was Becker? With lap four we had lost pace, but on lap 5 I was seriously experiencing muscle failure. Not the, “ow this hurts” variety, but the physical inability to get my legs to hold me in the bike. I finally gave up on bracing with my left leg and just dug my right leg in and tried to use my elbows for support. It really felt like I was going to just get sucked off the bike by the G-force, then the funniest thing happened. Gina had obviously sensed us flopping around more and more in right turns. Afterall, she is laying on my back. Well, not the type to ignore a problem she could do something about, Gina changed her body position to allow her left arm free to grab my torso and pull me back into position. Talk about a trooper! Here she is, climbing all over the bike for six laps, and still has the energy to give me some support. I suppose it makes sense if you think about it. Fast tracks mean less climbing around for the passenger, whereas short tracks tire them out. As a driver, the long, sweeping turns of fast tracks actually wear you out. Tight tracks are still tiring, but your left and right side muscles get a to trade duties. There was a pack hunting us both days. Wood Brothers Racing (Chris Wood/Aaron McEwen, #49) leads Team 321 (Donn Sayre/John Heenan, #321) and Lucky 13 Racing (Mark Macunga/Bobette Burdick, #13), who had just come back from three years on the inactive list. Photo Sean Bakken. Either way, we picked up the white flag and I could not see anything in my mirror. This was extremely odd. I was even scanning the track edge to see if Becker had broke down or spun. On the front straight the mirror is good enough to show a vague picture of what’s behind you. If it’s not the brown of the desert sand, someone is on their way. The mirror was dirt-drown and sky-blue. In Turn 2 my focus was on lap traffic. There was a vintage machine but they were clear to my left. Ahead of them there was a bike on the extreme left. There was no way to go around them except on the inside, but they were at the entrance to the corner. Suddenly they dove in and I was out of options immediately. I was not going to clear them by the time they reached the inside edge of the track. I was going to hit them if I went to the outside. I got all over the brakes and hoped that Gina was looking up to see the impending disaster. Just a few feet from impact I decided it would be better to hit the dirt than another bike and I shot off to the left. I missed them by a little over a foot and immediately turned right and opened the throttle. Somehow the bike did not spin. We were offline and in the loose dirt on track’s edge, but the bike maintained. My mind went back to the race and we completed the final lap alone, winning by a safe margin. 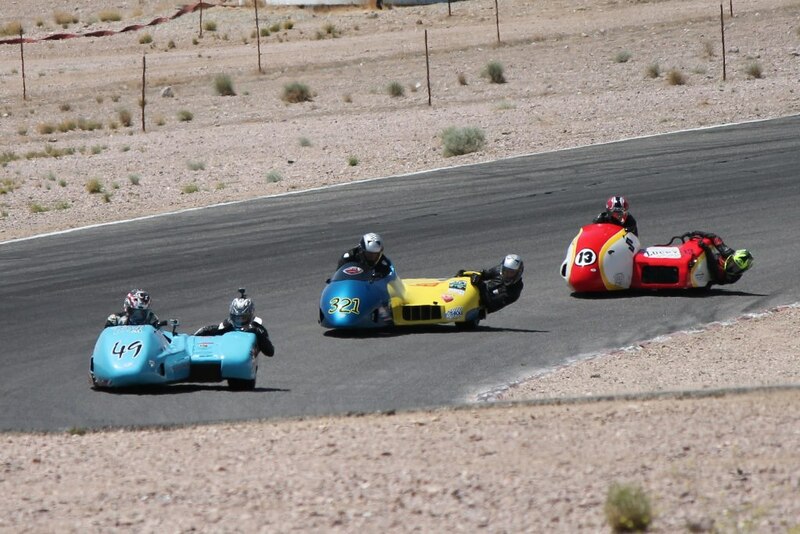 And that was round 2 of the SRA-West Formula Sidecar Series. Another race was only four days away in a track we had never been to, with a new challenger that had the home-field advantage. I’d love to tell that story but there is simply too much on the plate at the moment. The team is trying to find a path into international competition and we have a massive amount of repair/rebuild work to do before Pikes Peak (barely a month away). We also got ourselves a new (to us) van and it needs a bit of work if it is going to tow us through the Colorado mountains. At least I can leave you all on a good note; a double win to make us 4/4 so far in the season.